Insidious little digital chips have worked their way into every facet of our lives, whether we know it or not. Traffic lights, car bumpers, toothbrushes, toilets, utensils – the list goes on. They’ve even snuck into the plush toys our children snuggle up to at night, silently tittering away in assembly language and biding their time until daybreak. How much further will they integrate into our lives? Are we destined for a Borg-like future, assimilated into the collective and entwined by Bionanotechnology, all free-will forever deleted from our souls? Probably not. But the truth is that technology is set to continue its migration closer to our bodies, albeit in a more benevolent manner than science fiction would have us believe. In all likelihood, the level of techno-integration that future generations will unthinkingly employ will astound us, just as the thought of hurtling through the troposphere in winged jet-tubes would have astounded our ancestors. The trend is becoming all too clear; we are poised to enter the golden age of wearable technology. Do you remember the first time you saw the digital calculator watch? What a marvel of innovation that was! Along came the cellular telephone, with every iteration seeing a decrease in scale – from the Ghostbuster-esque backpack phone, to the cyborg-reminiscent in-ear models. We’ve learned some lessons along the way, certainly (an over-estimation of our calculating needs; an under-estimation of how silly an in-ear phone looks), but we’re figuring it out. It’s about ergonomics – that perfect fusion between function and design. Encumbrances of the past will not be tolerated. Technologies will need to work seamlessly together. A universal language will evolve to curate the exchange of timely and relevant information. And it won’t hurt if it looks cool, too. Eye glasses that work as a real-time HUD system will be fun and functional. Augmented reality will fuse history with currency, putting both a virtual tour guide and a digital Zagat in your pocket. Watches synced to phones allow for a hands-free conversation while driving. Touchscreen gloves in cold weather allow us to continue to interact with our devices. Technology designed to extend human capabilities, and to do it easily. More exciting still is the health and wellness potential. Imagine a watch that could warn you of an impending heart attack just from listening to the sound of your blood flow. Or a wristband monitoring arrhythmia or measuring blood-glucose levels. What about an undershirt that incorporates a defibrillator? What you put on that morning could ultimately ensure your safe return that night. Wellness applications are already well established. Digital pedometers are a highly effective means of general activity measurement. When combined with fitness software they become like digitized personal trainers. Body monitors are all part of the ‘Quantified Self’ movement, in what could be considered the evolution of prophylactic medicine. Store and upload your Biometric data to the Cloud for evaluation. Why not download the ‘health templates’ of Hollywood stars, in an effort to mimic their workout and dietary routines? What if your doctor could be alerted to a condition before you are? Hospital triage software could reduce stress on the healthcare system, optimizing staff levels to reduce wait times. Emergency services deployed algorithmically, with 911 calls made by sensors embedded in jewelry. Fallen down and can’t get back up? You’ll wait mere moments before help arrives. Health census data delivered in real time could help prevent epidemics. Interventions deployed instantly would ultimately prolong lifespans. Reducing uncertainty, predicting needs, preventing illness and improving the quality of life – this is the true potential of wearable technology. And all this started by a humble wristwatch calculator. 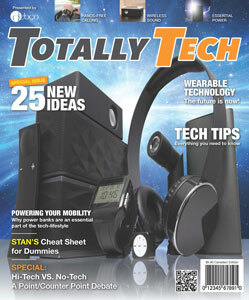 “Wearable Technology” is a feature article from Debco’s Totally Tech magazine, available on our Publications page here.